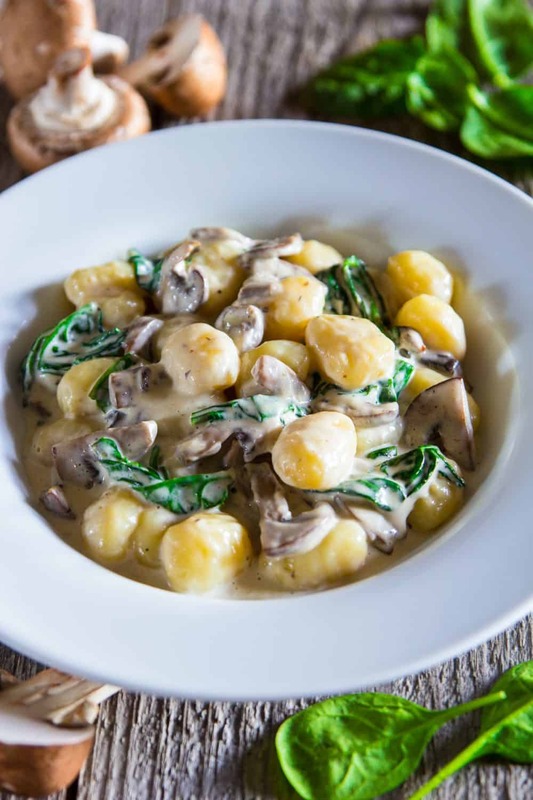 This 30-minute creamy mushroom and spinach gnocchi dish really hits the spot when you’re craving something saucy and comforting. It’s also a great quick recipe for Meatless Monday meals. I’m partnering with Fred Meyer and their #tasteofItaly event. Therefore, I’m bringing you this delicious and authentic Italian dinner. If you enjoy recipes like this creamy mushroom and spinach gnocchi, you may also enjoy these other gnocchi recipes. Heat the unsalted butter and olive oil in a skillet over medium heat. Then, add the sliced mushrooms and cook until tender. Now add the white wine and let it cook out. Then stir in the pressed garlic and heavy cream. Next, add the Parmesan cheese and spinach and mix it around with a wooden spoon until the spinach begins to wilt. Lastly, stir in the cooked gnocchi and season with salt & pepper. Gnocchi, pronounced (nyoh-kee) is a small dough dumpling made of potato, semolina, all-purpose flour, egg, and sometimes cheese. They can be flavored in various ways and are typically served in a sauce or soup. Place the gnocchi into a pot of salted boiling water then remove the potato gnocchi about 1 minute after they rise to the top of the pot. 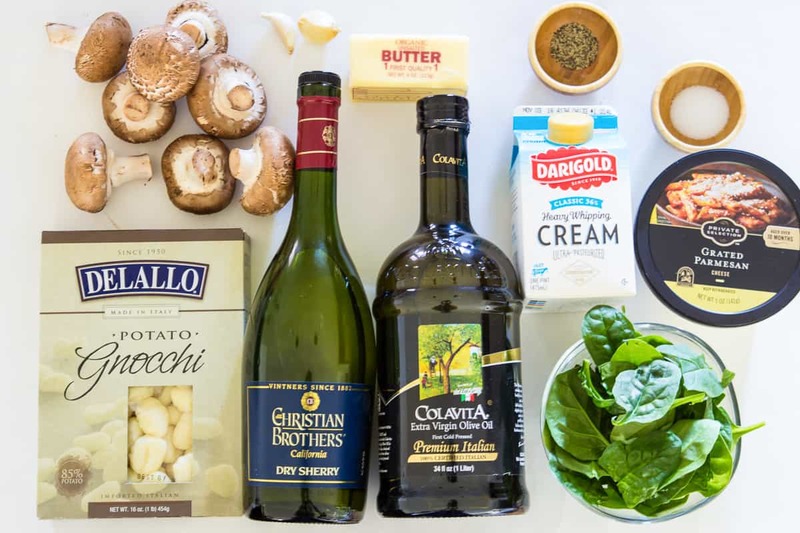 Creamy, saucy, and quick mushroom and spinach gnocchi recipe that will be on repeat for meatless Monday. Melt butter and olive oil in a skillet over medium heat. Sauté the sliced mushrooms until tender. Add the wine and let it cook for about 1 minute. Stir in the grated garlic and add the heavy cream. Cook the gnocchi according the package and strain out the water. Add the Parmesan cheese and spinach and stir for 1 minute until it is wilted. Lastly, stir in the cooked gnocchi and season with salt and pepper. This recipe was originally published on Sep 16, 2016, it has been updated since. Made this for dinner tonight. Quick, easy, delicious. Rich and creamy. I used white wine not sherry as pictured but I bet sherry would be great too. 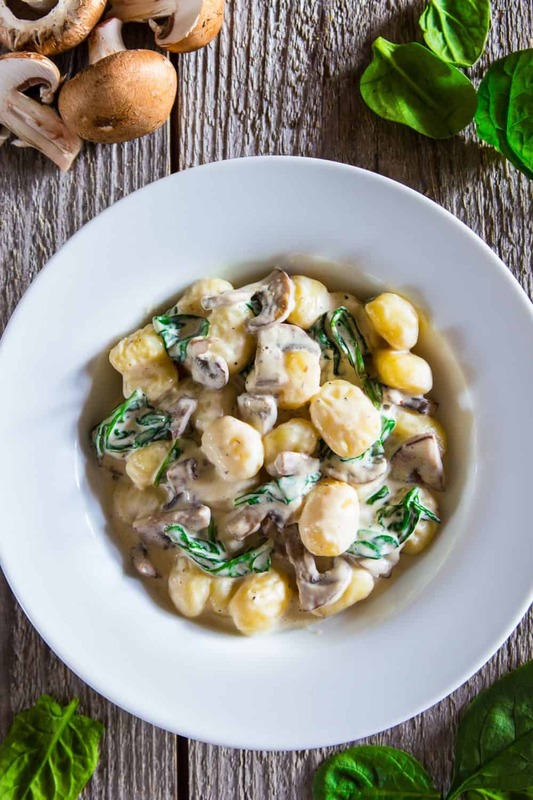 Thank you for leaving feedback Leila, I’m glad you enjoyed the creamy mushroom gnocchi recipe. Hi Pat, chicken broth is a wonderful substitution for wine. 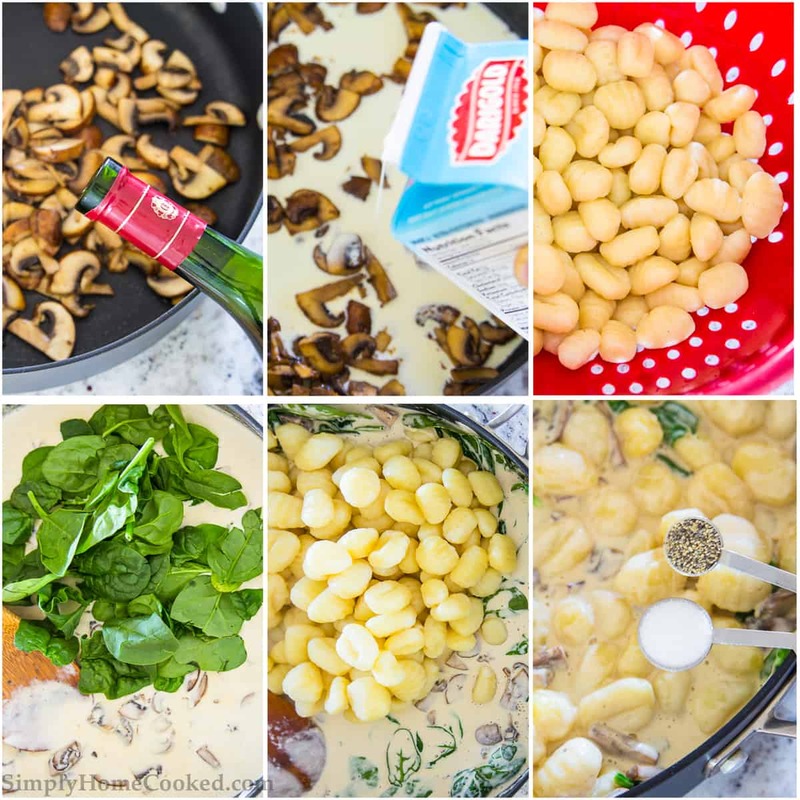 I hope you enjoy this creamy mushroom and spinach gnocchi! Just made this, it was amazing! And I can’t cook! Hey Harriet, I’m glad to hear that you enjoyed this recipe! 🙂 Thank you for your feedback! It’s all personally preference Michael. But great idea. can you leave out the white wine? Hi Afiona, you can substitute the wine with chicken broth. So sorry about that, I just updated the recipe. There is 4 cups of spinach.